December – GMC supported composer and conductor Alexander Campkin, who on 22nd December performed with the Oxbridge Singers an annual Carol Concert at Trafalgar Square. This year’s event was in aid of Cancer Research UK, which supports over 500 leading research groups throughout the UK with funding of research institutes, clinical centres, programme and project grants. Visit the Cancer Research UK website for more information about their activities and find out more about the music at the Alexander Campkin website. 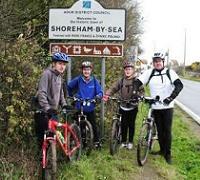 December – GMC sponsored (50GBP) Jack Mercer who cycled 54 miles with his dad and friends to raise money for Doxy Challenge Charity. They appealed for help to find a treatment for Jack’s mother who suffers from LAM Disease – a rare lung disorder, which only affects one in a million women. 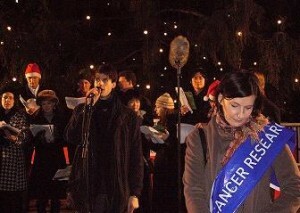 The money raised will fund research into a cure for the disease, in particular into the use of the drug. You can visit the Doxy Challenge website by clicking here. November – GMC supported youth football by sponsoring the Thurrock Lions Kit for 2007/2008 season. The Thurrock Lions belong to the Thurrock Football Club which was established in 1980 and includes 28 teams of boys and girls aged 5 – 18. You can visit the Thurrock Football Club website by clicking here. September – GMC consultant, Melanie Jenkins, completed the 14 km Carrantuohill Trek to reach the highest peak in Ireland, standing at 1,001 m (3,414 ft), in aid of Grooms-Shaftesbury, a charity that supports disabled people and marginalized communities. GMC contributed 150 GBP towards the event. You can visit the Grooms-Shaftesbury website by clicking here. September – On Sunday, 16th September, Dorota Drozdowska, a GMC employee completed the Hydro Active Women Challenge – a 5 km road running race in London’s Hyde Park. With a great time below 26 minutes she managed to be within the top 2%, leaving around 15,000 women behind. In addition, a total of 500 GBP was raised for the nominated charity, Breast Cancer Campaign. August – GMC contributed 250 GBP to support a Deutsche Bank Team which for the second time will participate in The Enduro Challenge 2007 and will: run 150 km to Dover, swim the English Channel to France (40 km) and cycle 300 km to Paris. This admirable charity action is meant to raise money for Sparks, the children’s medical research charity and help fund vital research into Autoimmune Liver Disease. You can visit the Sparks by clicking here. 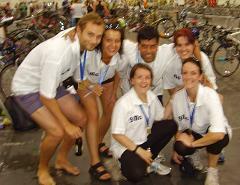 August – On Saturday, 4th August, two GMC triathlon teams completed the Michelob Ultra London Triathlon. Both teams finished the event with overall times in top 50% of competitors, leaving around 200 teams behind. In addition, a total of 2,000 GBP was raised for the nominated charity, NSPCC. 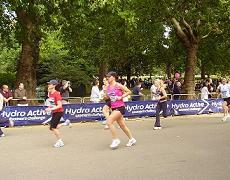 July – GMC has entered two teams to compete in the 2007 London Triathlon to be held on August 4th. Each team member will complete one of the three disciplines: swimming 750m, cycling 20km and running 5km. The goal is to raise money and financially support the NSPCC – a UK charity specialising in child protection and the prevention of cruelty to children. You can visit the NSPCC website by clicking here. July – GMC sponsored (GBP 150) Rohit Sharma who is planning to participate in 10 km run to raise money for the Pratham Charity and support its ambitious goal of providing accelerated reading, writing and arithmetic skills to over 60 million Indian children over the next three years. You can visit Pratham website by clicking here. June – GMC donated GBP 100 to Christopher Narbeth’s daughter Lindsay. At age 11, she has committed to participate in a charity cycle ride over the first stage of this year’s Tour de France. Lindsay aims to raise money for Demelza House in Kent – a hospice providing end-of-life care and bereavement support for children who are terminally ill. You can visit the Demelza House website by clicking here. June – GMC sponsored (GBP 200) Mohit Midha who has done the British 10K run to raise money for the Pratham Charity which activities focus on developing the education system of children in India. The Pratham movement is an inspiring coalition between corporate leaders, community leaders and the government. Since inception, Pratham has reached over 2,000,000 children. You can visit Pratham website by clicking here. May – GMC donated GBP 100 to a Barclays Bank team lead by Karen Pleva. The team of 6 tackled on the 12th May the three highest peaks in Yorkshire – Penyghent (694m), Whernside (736m) and Ingleborough (732m) covering a total distance of 24 miles and climbing 1,672m. The money they raised went to Cancer Research UK, which supports over 500 leading research groups throughout the UK with funding of research institutes, clinical centres, programme and project grants. You can visit the Cancer Research UK website by clicking here. May – Our Consultant Milan Kothari has successfully reached the Everest Base Camp (5,364m) and managed to raise more than GBP 3,800 to support the Whizz-Kidz Charity. Money will be used to provide wheelchairs and other equipment for disabled children. February – Two GMC employees, Prem Goyal and Monika Miksakova, participated in a 6-day trek to climb the highest free-standing and “walkable” mountain in the world, and also the highest peak in Africa, Kilimanjaro. As a result of their fundraising, they contributed GBP 500 to the Village Education Project which aims to provide children in Tanzania with the education they need to become self-supporting citizens. The charity works with local communities to build, renovate and assist government primary schools in the Kilimanjaro region. 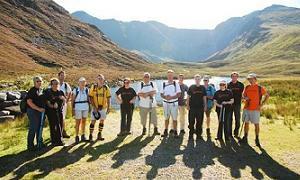 They also raised GBP 2,000 for SPARKS, Deutsche Bank Charity of the Year, in order to help newborn babies. 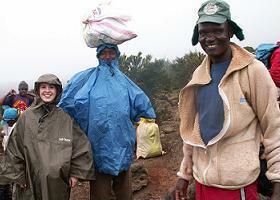 You can visit the KiliProject website by clicking here and the Sparks website by clicking here. 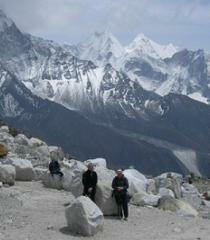 January – GMC donated GBP 500 to Milan Kothari (GMC Consultant) for trekking to Everest Base Camps. This 13-days expedition is to support and raise money for Whizz-Kidz – charity that raises money for disabled children in the UK, providing customized wheelchairs, tricycles, training, information and advice thereby allowing them to lead independent and confident lives. You can visit the Whizz-Kidz website by clicking here.